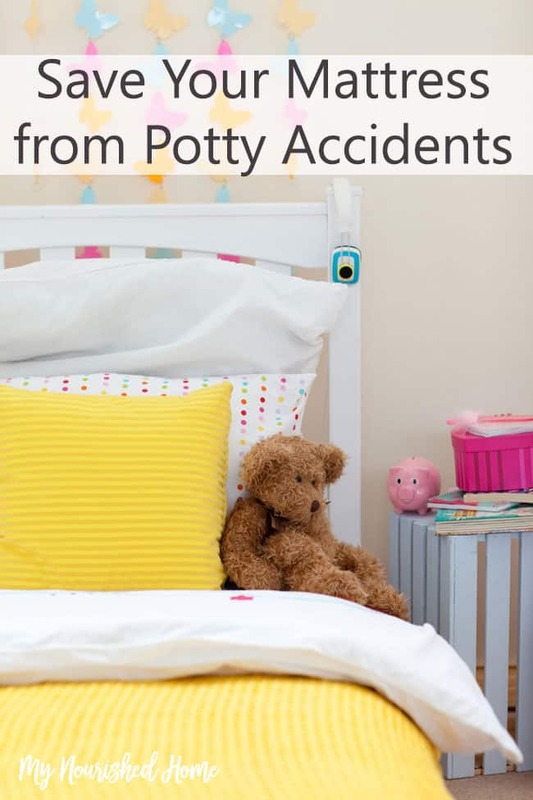 If you’ve ever potty trained a toddler, then you know that accidents happen and they happen everywhere. They happen in the car, they happen on the floor, and they happen on a mattress. 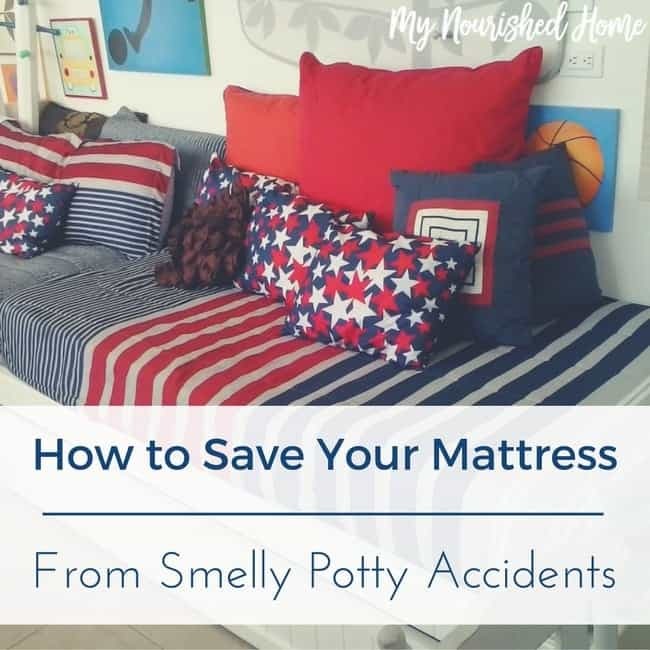 Considering that mattresses are ideally a long-term commitment, I was desperate to come up with a way to save the mattress from potty accidents – and remove the urine smell from the mattress! 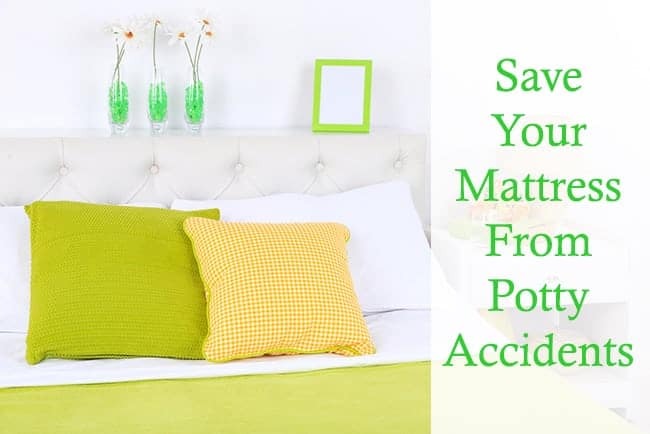 It’s really helpful to have a waterproof mattress cover – I actually have one for each bed in our house since there are times the kids end up napping or sleeping in different beds. But they’re also pretty expensive. Often, I would find that we went through spells where bedtime potty accidents happened more often than others. So one night, I would be washing our waterproof mattress pad, and then the next night, we would have another potty accident on the mattress before I could get it back on the bed. So I came up with a couple of good, useful hacks to help protect our mattresses so they didn’t need to be replaced before I got my kids out of diapers! I also wanted my mattresses to be and smell fresh for guests when they came for a visit. The first tip for protecting your mattress from potty accidents is to stock up on plastic picnic tablecloths. Any plastic cloth will do, but if you use the kind with the checker pattern on the top and the felt backing, turn it upside down on the mattress so the felt is facing up. And then make the bed normally. The plastic on the back will keep any potty accidents from leaking into the mattress. When a potty accident does occur, they’re so inexpensive at the dollar store or the local drug store that you can just throw them away. I always keep a couple of extra picnic tablecloths in the cabinet for just this reason, so that I can replace them easily. This is also a great hack for when you when you’re traveling on vacation and need to protect a mattress that might not be yours from a toddler potty accident. 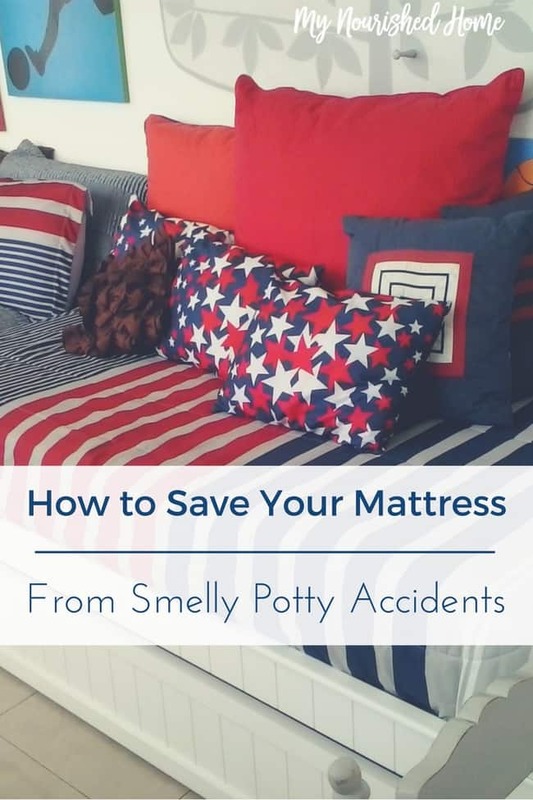 When potty accidents do happen, it’s important to know how to remove the urine smell from the mattress and minimize that nasty bacteria that can make a home in your mattress. To remove urine smell in the mattress, combine a cup of baking soda with 20 drops of tea tree oil, 10 drops of eucalyptus, and 10 drops of lavender, and then mix together. It won’t be a paste, it’ll be a little damp but it will still seem like powder. I just use a fork to mix mine together. Sprinkle the baking powder formula all over the mattress and use a soft-bristled brush to work it into the mattress. You need to leave it in the mattress for at least half an hour. But truthfully, I put mine on the mattress in the morning and leave it for most of the day. Before you remake the bed that evening, use your vacuum cleaner and vacuum the excess baking soda from the mattress. You might actually find that this process for refreshing your mattress works well for all mattresses – not just the ones you kids have used. Consider mixing up the essential oils you use in the baking soda mixture for a scent you love. This is a good idea for people with elderly parents too. I think you are right. We also use this same tip to freshen our mattress because our dog likes to sleep on the bed too.